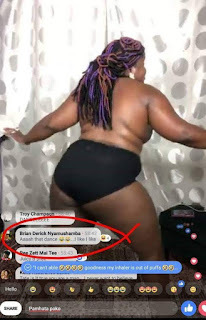 Tatenda Karigambe shocked many on Facebook when she danced naked. Her video which is still online had an audience of over 4 000 viewers at its peak. It has had over 345 000 views in one day with over 16 000 comments. She insists that she does not care what people think. “Those who have any opinions on what is morally accepted or not please teach that to your kids. Ini nditori bho nehunhubu hwangu,I tell my story the way I want and mind you I’m an adult who makes her choices wisely . This is the just beginning Zimbabwe,we brought everyone from all the corners of the world and yes Zimbabwe we made them talk because we can. Unosvika pakubata mudonzvo uchingoudzirwa how to live your life,zvimwe itawo zvinoda chitaka Chako mhani.